W Bali continues their on-going support of the burgeoning local scene through their latest concept, Foundation. Having most recently given the current crop of Indonesian DJ’s a platform to show how good they really are, W have now extended this concept out to the wider region with a slight twist, as they handpick the finest and most talented resident DJ’s across the whole of Asia from some of the most recognised clubs and venues in the region. First up Kilo Lounge resident Maurice Simon! A presence on the DJ circuit in Singapore since 2008 and a Heineken Green Room Music Ambassador, Maurice is a resident DJ at Kilo Lounge and creator of the club’s bi-monthly Re:fuge house and techno parties. His musical journey began with a discovery of the nu-jazz and broken beat genres pioneered by Jazzanova, Trüby Trio and 4 Hero. He later ventured into the deep house and techno spectrum, inspired by time spent as a promoter for Ben Watt's iconic London-based Buzzin' Fly Records, and early releases put out by German labels Compost Records, Sonar Kollektiv and Dixon & Âme's Innervisions since the early 00’s. Bandwagon Asia describes his sound as a 'deft marriage of deep and melodic house with tough and moody techno', and his sets are blended with the influence of genres ranging from vintage jazz, soul, disco, funk and electronica which remain at the forefront of his creative consciousness. His versatility has seen him booked to perform the opening set for a diverse selection of international heavy-weights, including Âme, Marcus Worgull, Dave Seaman, The Revenge, Night Talk, Andre Crom, Sei A, Rainer Trüby and Till Von Sein. 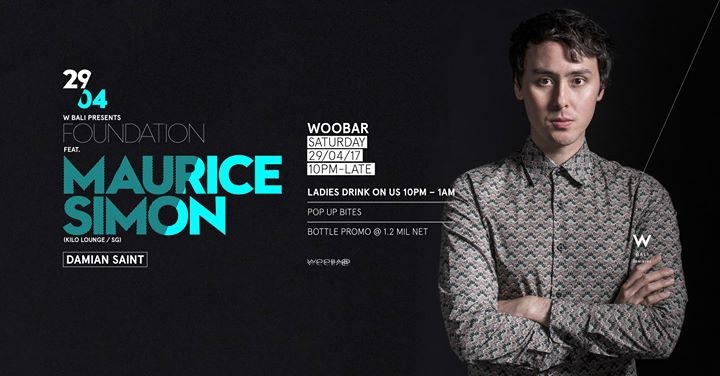 Maurice has made festival appearances at ZoukOut (2013, 2016), Ultra Singapore (Resistance Stage) (2017), Thailand’s Wonderfruit Festival (2017), and aside from his Kilo residency has recently performed at leading underground clubs across South-East Asia including Velvet Underground, Zouk, Headquarters and Kyo (Singapore), Koh (Bali), Jenja (Bali & Jakarta), Pisco Bar and Under9 (Kuala Lumpur), Hide & Seek (Jakarta) and Mustache (Bangkok). In March 2016, Maurice's set at Hide & Seek was featured on Pulse Radio's inaugural edition of 'Asia's Best Mixes of the Week', in recognition of his growing profile around the region.